Muse of Doom is dooming! Feu de Vie‘s Muse of doom is telling us to “bring the heat” to this month MxMo! Be sure to check the roun-up post. So, as promised, we bring you Burnt Sugar Syrup! Here’s How! Put a cup of sugar in a pan on the stove and forget about it, when you come back it should be all caramel dark liquid. Now it is time to put a cup of water. This will get bubbling just like lava! Stir until all the bit of sugar are dissolved, take out of the fire, let it cool & bottle! You can use it to make delicious Daiquiris and Whiskey Sours, but today we’re going with a non-alcoholic Lemonade! Shake & strain into an ice-filled pint glass. Top with bubbles and garnish with a lime wheel. It doesn’t tasted like Brandy (“burnt wine”), but was complex and refreshing with the vanilla and caramel playing together with the lemon-lime acidity. You should check Darcy’s post about Cognac Oil! Feel free to play with the syrups and juices. We love Strawberries lemonades, but also have fun mixing mango, guava or watermelon lemonades! We also intend to do an alcoholic version tomorow, so check out our post for some caramelized honey fig yummyness! Our thanks to the Muse of Doom and Fred Yarm for keeping up the fire of MxMo alive! Last night I was working at an event, the 10th birthday of a local joint of hamburgers. It was a 50’s themed party, we had 6 classics (Old fashioned, Orange Blossom, Tom collins, Sidecar, Mint Julep and Plunter’s Punch). Well, in that case you’ll be sitting there with your friends for hours and some dashes of bitters won’t hurt. I asked if a little alcohol could be used, and made my favorite mocktail. Coat the glass with bitters, then put ice, lime, lemonade and stir. But sometimes, no alcohol at all will be requested. 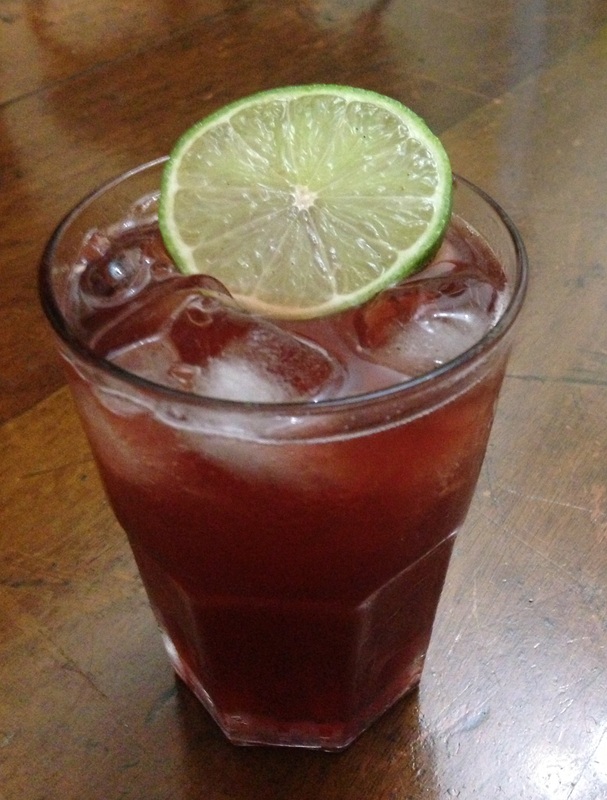 You can try Italian sodas (a syrup with soda) or some muddled fruits with a juice and soda. Also, give it a nice garnish! A nice tip from Paul Harrington is using mango, papaya or guava juice instead of the usual orange juice, because those other fruits barely are seem in cocktails recipes besides being tasty. But, always look for balance. Another tip is 2 parts juice and 1 part mixer. Maybe 2oz orgeat, 1oz lime and soda. You don’t need to put soda in all of them, ok? But, sometimes the person just don’t like the taste of alcohol. And “that’s the best alcoholic cocktail I’ve ever had” was what I received for my L.L.B. Those costumers probably find alcohol very bitter, for some reason I can’t remember why and can’t find the source. For those, you can put a little salt and see if they’ll like it. Others just don’t have their favorite spirit, try giving them something more light in the taste, maybe a mojito. LATE UPDATE: I just found this amazing prohibition book about mocktails.